"When I am taking pictures, I completely forget myself. I only concentrate on what I can see through my camera." František Štaud was born and bred in the little town of Polička in the Czech Republic and fell in love with photography at the age of 8 or 9. Surrounded by the beauty of the Bohemian-Moravian Highlands and fascinated by the technology of the camera, he used to take snapshots - of his classmates, of the scenery and of wildlife - for hours on end. He learned many of the secrets of the craft from his father, who was an amateur photographer himself and encouraged his son's enthusiasm. It not infrequently happens that the urge to creativity is passed on in this way from father to son. "Photography was in my blood," says František. "I loved nature, landscapes and people. But I had to work hard to make money to buy my own camera. I did odd jobs for my parents, for which they paid me. And I worked for a market gardener where they grew fruit and vegetables. I didn't spend my wages on visits to the cinema or sweets, but saved them up till I was able to buy my own camera, a Zenith EM, when I was 12." František has never been without a camera since. His parents owned a big house, which allowed him to convert a spare room into a darkroom where he started developing his own black and white films. "It was a beautiful darkroom, just for me. I spent many evenings there, developing films, enlarging prints, no one disturbed me." Apart from an up and coming photographer, young František was also a keen traveller and a writer of travel stories. That is how a boy who was born into a simple family in an unremarkable Czech town grew up to be a world-famous photojournalist. Today, at the age of 44, he has tens of thousands of photos in his files, many of which have appeared in books, newspapers, calendars and prestigious magazines all over the world. František Štaud is one of the most widely published Czech travel photographers: the world is his oyster. "Becoming a professional photographer was not an option in the dark days of Communism." "Actually, I never thought of becoming a professional photographer when I was growing up. I liked taking pictures, I even started making slides, but there was no way I could make this my profession while the Communists still controlled our country. So I went on taking pictures as a hobby until I was 18, and then I had to take a break because I wanted to study pharmacology at Charles University in Hradec Kralove, in Eastern Bohemia. When I graduated at the age of 23, I was lucky enough to get a job as a researcher at the University of Kyoto in Japan. So I went to Japan for 2 years and later on for 3 years to Manchester in the UK, also to do research at the university. After having worked abroad as a scientist in this way for 5 years, taking photos in my spare time, I came back to the Czech Republic and became a full-time photographer." František Štaud, who remains a professor of Pharmacology at Charles University, can also look back on a colourful career as a travel photographer, roaming from continent to continent in search of that perfect shot that surpasses all the others. He has captured the essence of unique human beings in the farthest corners of the globe - young and old, working or just standing, staring; in schools, temples or crowded markets. 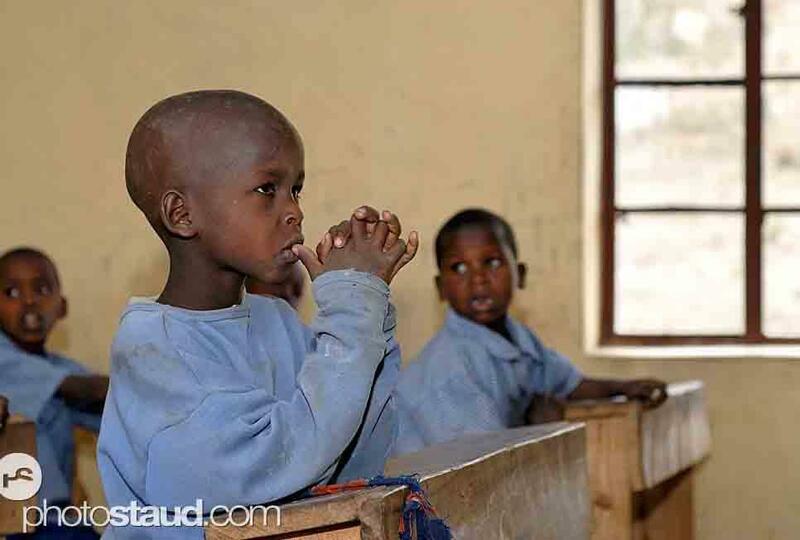 A young African boy just waking up to the reality of the struggle for existence, or a gently smiling old man in Kenya, wrapped in a traditional red and orange blanket and leaning on a stick as he looks back on his long life (see photo at the end of this article). Not much escapes the sharp eye of the photographer. František Štaud is always looking for new impressions. 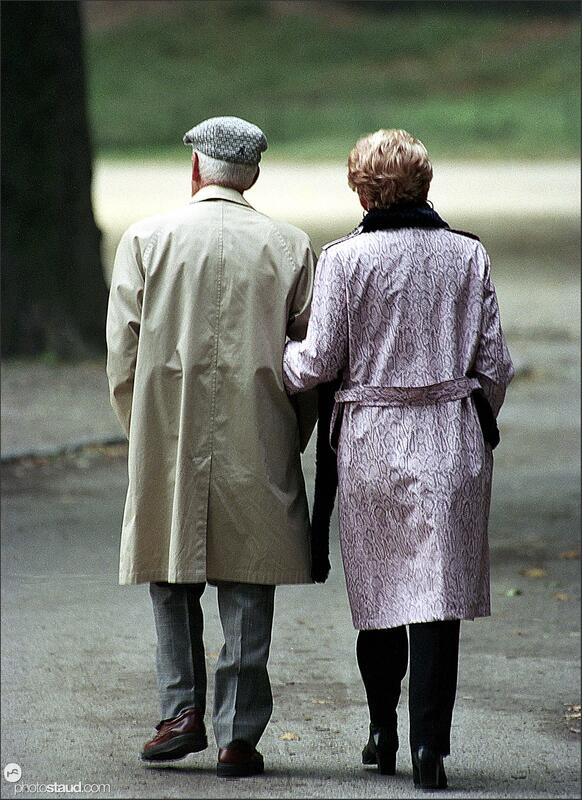 An old couple in their raincoats in Central Park, New York, walking into the distance, on their way to the future. 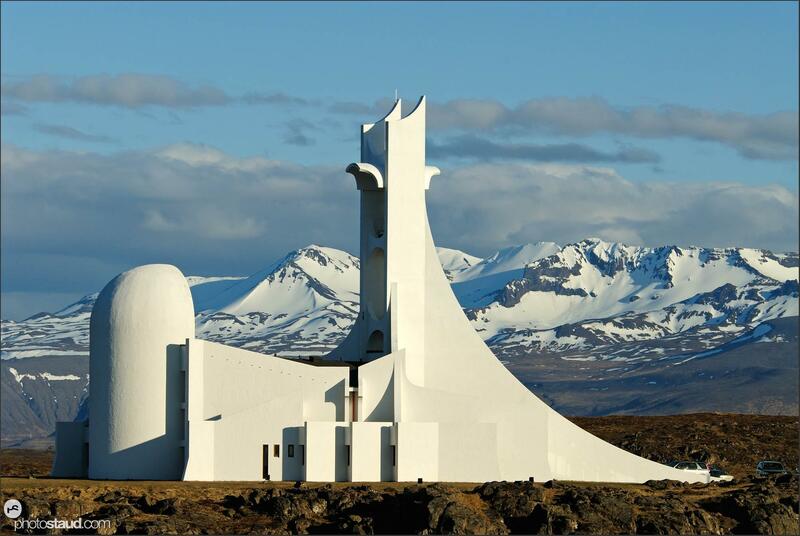 Dazzling sunrises or sunsets in Egyptian mountain landscapes, blood-red Japanese maple trees, traditional temples and modern architecture in Cambodia or a striking white church seen against a background of snow-covered mountains in Iceland. "Always in search of a nice touch of light"
Photography is watching and waiting until the right light falls on a sleeping lion, trekking through perilous terrain alone or accompanied by a guide, taking cover, keeping your distance and then simply pointing and shooting when the right moment comes. Photography is finding the right composition for your picture, collecting images and impressions. "I just keep my eyes open"
"I just follow the light when I am taking pictures," says František Štaud. "Light is an important factor in photography. When I go on a long trip or expedition, for instance to the desert or to a river in a rural area. I usually do my homework before I go. I try to imagine what I could do beforehand and then I just go and keep my eyes open. I am always in search of a nice touch of light. That's what I like." "I also like heavy weather photography, taking pictures in heavy weather delivers very good photographs, you know, with all the raindrops, snowflakes and so on. Especially rain photography is very beautiful." When František Štaud went to Kyoto in Japan to continue his studies, he was overwhelmed by the beauty and traditions of the country. "The Japanese countryside is really beautiful," he says, "so different from Europe and America. Kyoto is the most beautiful place in Japan. It has a lot of old traditions like the geisha and special gardens inside temple precincts. When I arrived in Kyoto, I immediately started taking pictures again at full speed." Kyoto, known as the City of Ten Thousand Shrines, is the cultural centre of Japan. The imperial capital of Japan for more than a thousand years, it is now the capital of the Kyoto Prefecture of Kansai region. Kyoto has about 1600 temples and is famous for its gardens. Every type of Japanese garden may be found here, from austere rock gardens or karesansui (often known as Zen gardens) to the flamboyant gardens where the Shoguns and Emperors used to stroll. Maruyama Park, a public park next to the Yasaka Shrine in the Kyoto's Higashiyama District, is full of people who come to see the cherry trees in full blossom in early-April. The centrepiece of the park is a tall shidarezakura (weeping cherry) that is lit up at night. "The Japanese landscape is really fantastic," enthuses František. 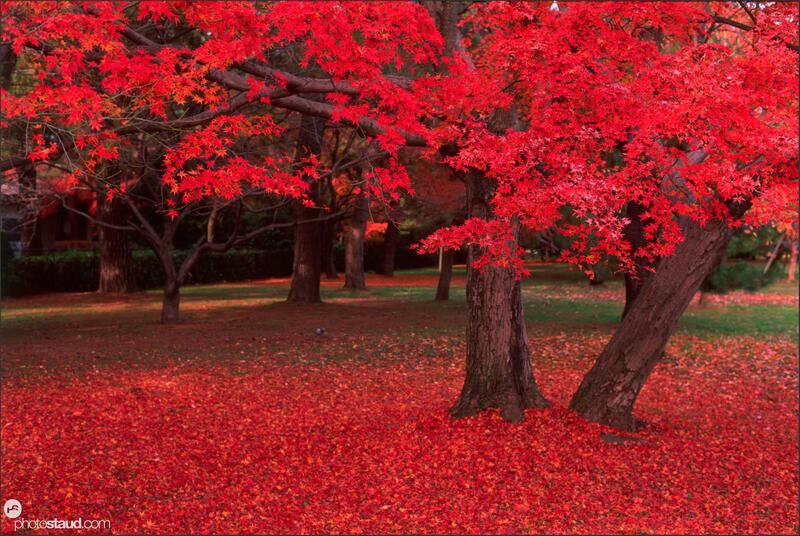 "You can see maple trees all over the world, but only in Japan do you get those rich, red colours." The picture above is from the Kyoto Imperial Palace Park, near the palace where the emperor lived. The famous Jizo statues, located in the Kanmangafuchi area of Nikko, some 140 kilometres north of Tokyo, are arranged along a line some hundred metres long, looking down on the Daiyagawa River. 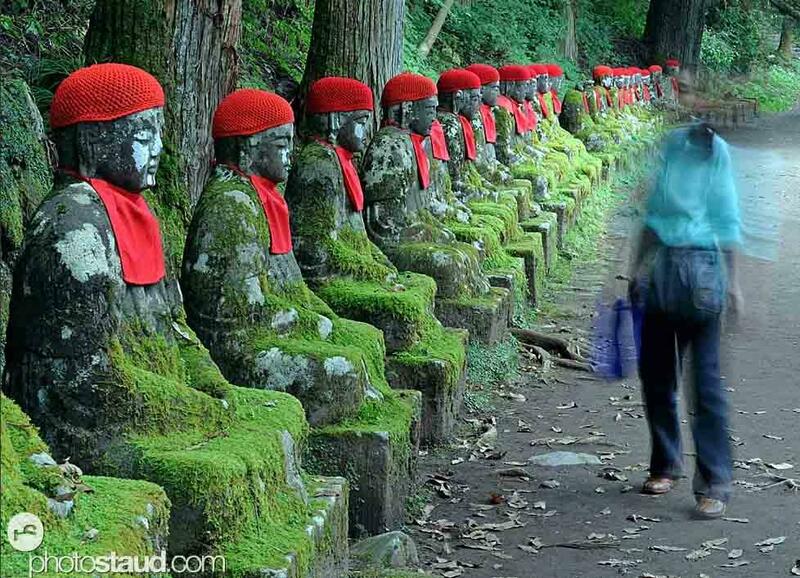 Jizo are the protectors of the souls of travellers and unborn children. The statues are also known as "Bake Jizo" or "Ghost Jizo", because each time they are counted the total arrived at always seems to be different. Some of the statues have lost their heads in earthquakes or through the action of floods, but the missing heads are always placed close to their bodies. Jizo statues are traditionally adorned with knitted hats or scarves, or given toys as presents for the souls of the children they are supposed to be guarding. These statues, and the Nikko National Park where they are to be found, are favourite tourist destinations. "You just can't stop shooting pictures in Japan." "Japan is a wonderful mixture," says František Štaud. "You can find old buildings, beautiful scenery and highly photogenic cities like Tokyo. The Japanese people, especially in the rural areas, in the villages and the mountains, are very open and kind. You just can't stop taking pictures in Japan. I had a good contact with the people, because I lived close to the people, I was not a visitor, I had my life there. I have returned to Japan several times and I travelled it from north to south. I was also very much impressed by the Japanese animals, like the snow monkeys and their baby monkeys, bathing in the hot springs. 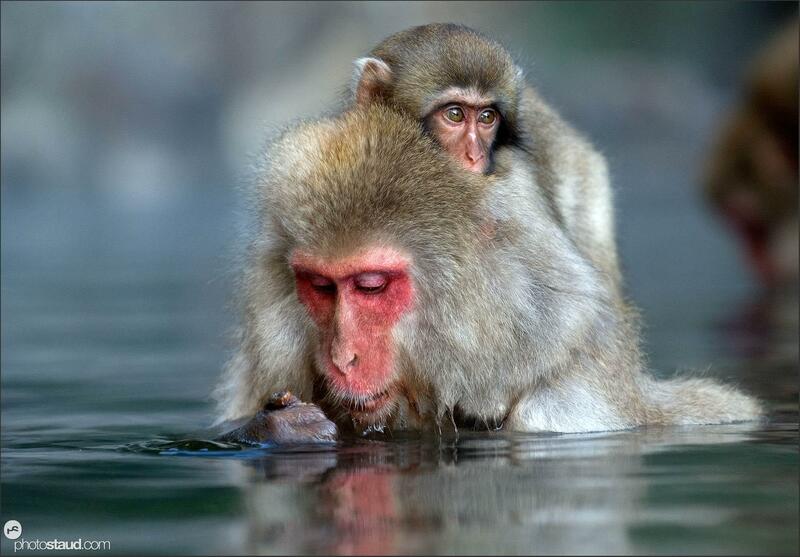 In winter, when it can be cold in Japan and there are heavy snowfalls, the snow monkeys or wild Macaques, go to the Jigokudani National Park, located in northern part of the prefecture, to warm up in the hot springs. It is about 2 hours by train from Tokyo. It is a very interesting place." "After my stay in Japan, I went to Manchester University for 3 years," František continues. "I got a lot of research done, but I took every opportunity to travel in my spare time. I explored England, Scotland and Wales, concentrating mainly on landscape photography. The scenery was very beautiful, especially in the north of England and in Scotland, but I also found the culture to be quite different from what I was used to. I visited many islands off the west coast, such as Skye, Rùm and Eigg. I loved travelling around these places. I also went up as far as the Faroe Islands to take photographs." Štaud took many pictures on the Jurassic Coast in the English county of Dorset. 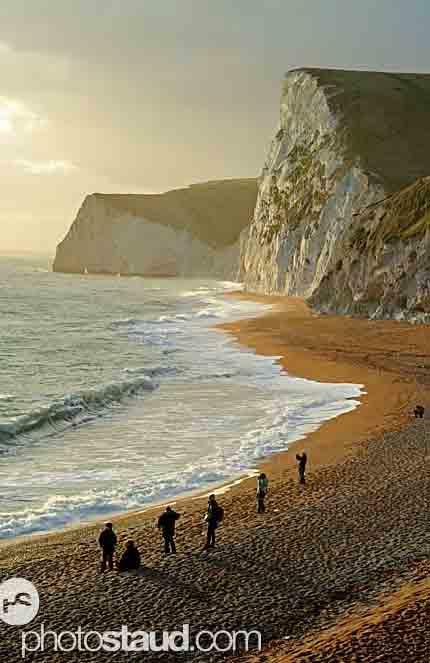 The Jurassic Coast is a 153 kilometre (95 mile) long shoreline along the southern coast of England. It was designated a World Heritage Site in 2001 and contains a number of unique geological features including the natural arch at Durdle Door, Lulworth Cove and many limestone cliffs. The Jurassic Coast is considered to be the only place in the world to display unbroken evidence of 185 million years of geological evolution. If offers a 'walk through time', displaying some of the most amazing rocks, fossils and landforms on Earth. The Coast itself has been carved out over thousands of years by successive Ice Ages and changes in sea level. 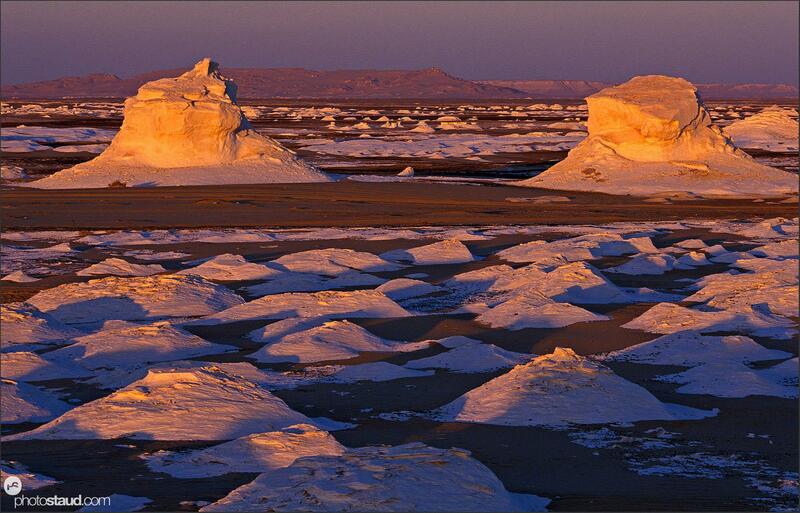 The result is a truly spectacular landscape telling a story that spans millions of years of the Earth's history. In Cambodia František Štaud took pictures of temples, monasteries, village schools, flooded fields and villages, people selling dried snakes, traditional Khmer dancers and 'meditative' cows on dusty roads. 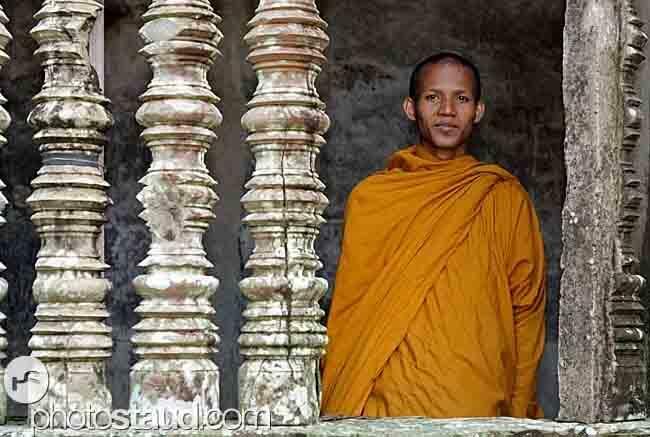 At the UNESCO World Heritage Site in Angkor, Cambodia, Štaud took pictures of the Lolei Temple and the Temple of Angkor Wat, and of a school for Buddhist monks and a monastery in the Bakong Temple. The photo of the Angkor Wat temple in Cambodia shown on the left is typical of Štaud's work. He waited until all the tourists had gone to take this picture, to highlight the beauty of the temple and the age-old stone pillars. 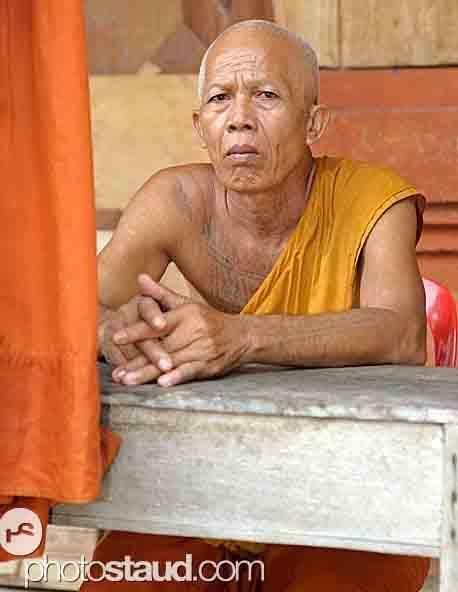 He also photographed a monk in a saffron robe, contrasting strongly with the grey architecture of the temple. "The pillars on the left are thousands of years old," Štaud explains. "They can be seen as symbolising the age-old three pillars of Buddhism." 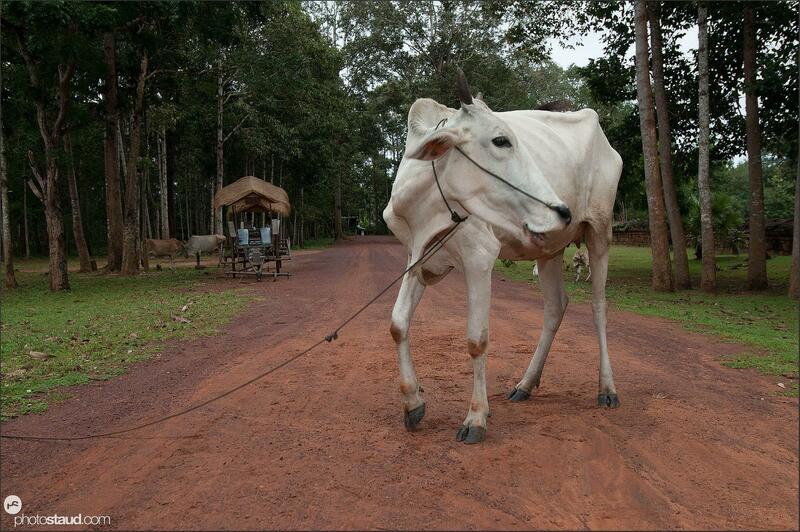 The three pillars of Buddhism are Sila (morality, charity and compassion), Dyâna (concentration) and Prajna (wisdom). František Štaud:"Next to them you see this smiling young Buddhist monk, who in my view, represents in a way the fourth pillar of Buddhism, because his living input is keeping the tradition alive." The fourth pillar of Buddhism is Sangha (the fellowship of the monks). 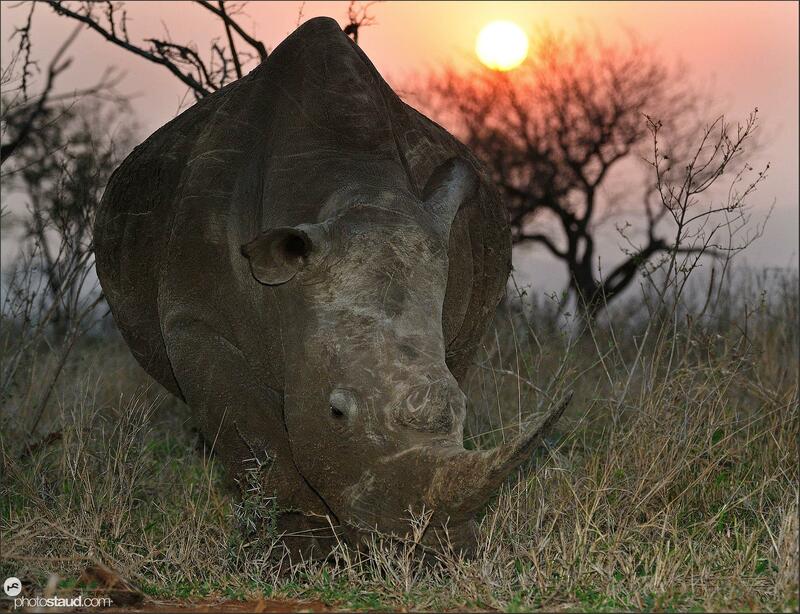 'I feel attracted to wildlife and people. 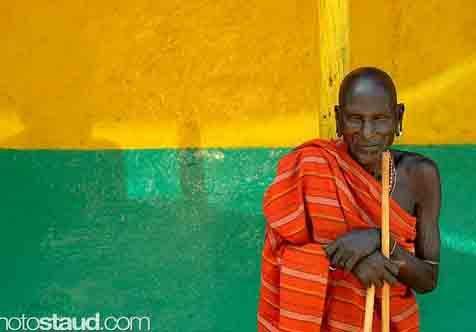 I practice cultural photography, for example in Africa. This is different from so-called street photography, where you just take snapshots of people or situations you happen to come across. If you don't grab your chance, the opportunity is lost. Cultural photography requires more preparation. 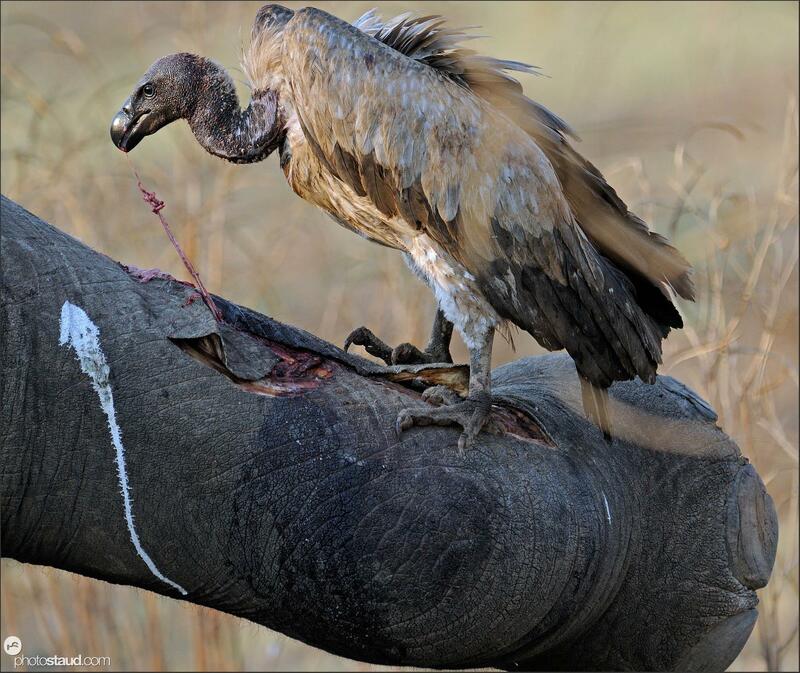 I have taken thousands of pictures of most extraordinary people and animals, like the vulture scavenging off a dead elephant. 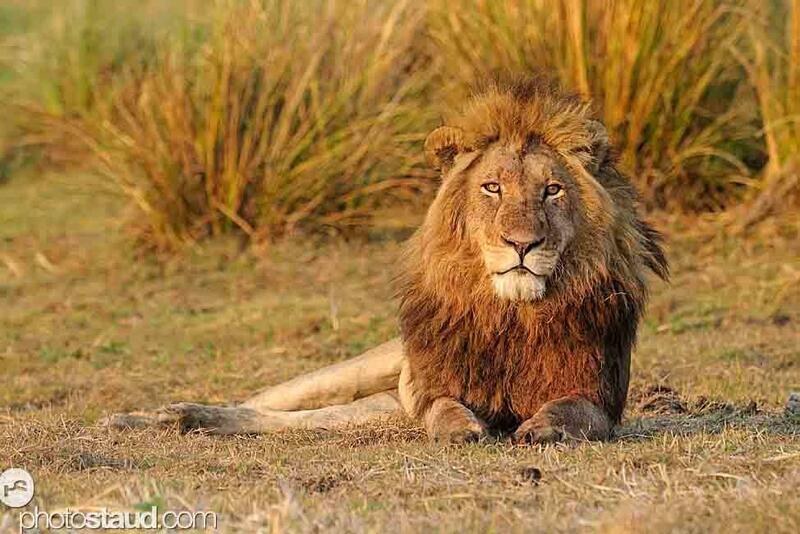 I had to work under very difficult conditions, sometimes lying on the grass in front of a lion or a hippopotamus waiting for hours for the light to be just right." "I don't like stealing photographs of people"
"People got used to me in Africa, and allowed me to photograph them," František emphasizes. "To me that is important, because I don't like 'stealing' photographs of people. I always approach them, smile to them, and build up a relationship, using body language or, if possible, by talking. We sometimes even talk for hours before I take any pictures. I don't like just taking a photo and walking off. Street photography, on the other hand, may force you to grab each opportunity as it comes, point and shoot; you have no time to wait. Sometimes you come across an interesting situation or person and you have to take the picture immediately. Then I shoot without his knowing, because otherwise, if he would look at me into the camera, it wouldn't look natural. If I would ask for his permission, the situation is lost and never comes back." "In Armenia, you can still feel the war between Armenia and Azerbaijan that ended 20 years ago. My activities there could be classified as social photography. I took pictures in hospitals, where I talked both to the doctors and to the patients. Armenians are generally lovely, talkative people, but the situations you come across in some places may be very grim. I took pictures in all kinds of institutions, schools etc. in Nagorno-Karabakh that reflected the damage caused by the war. The photos I took in orphanages were very moving. I feel very close to the Armenian people, because both the Czechs and the Armenians have suffered from Russian oppression. All the pictures I took in Armenia were in black and white. I photographed all kinds of people, little girls, women, walking through the ruins of war. People are still living under very difficult conditions there."